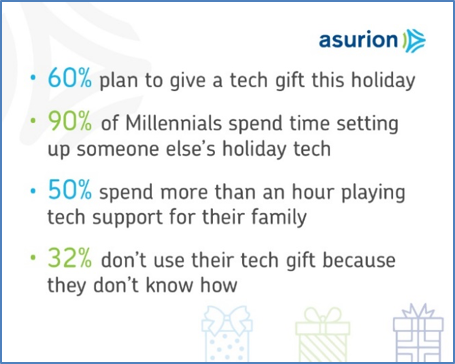 Sixty percent of U.S. adults are expected to give the gift of tech this holiday season, and 70 percent say they’ve helped family members set up or troubleshoot their tech gifts in the past. For Millennials and Gen Xers, the rate is much higher. Ninety percent of Millennials and 80 percent of Gen Xers say they’ve had to dedicate time serving as the resident tech support during the holidays. Half spent between an hour to more than four hours helping family with their devices.